Let's take a little break from all that mango madness, shall we? It's a long summer, that's plenty of time to get to all that, right? That's what summer is about - a little break from everything, and pacing yourself a bit...and technically it's still late spring, after all. All that didn't keep me from taking a little personal break myself last week to enjoy the canyons and mountains in and around Zion National Park. If you're ever out that way on vacation, be sure to look up these guys, they'll be sure to show you a good time...as long as your idea of a good time includes intentionally dangling off a cliff. Much thanks to the Rodgers for holding down the fort all week, and Nathan and Sonia, enjoy your week doing whatever the heck it is you're doing this week. Anyways, back to the matter at hand: Trader Joe's Shooting Stars. Yeah, from the packaging and whatnot, they almost look like a TJ's take on those cheapie gas station pyrotechnics. 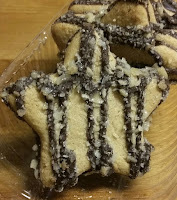 The real truth is a little less exciting than that - chocolate coated shortbread cookies (ho-hum)...but wait? What's this? "Covered in popping candy"!?!?! Now, that sounds like fun!!! Let's do this! Yes, we've seen this gimmick before with don't-call-them-Pop-Rocks candy, or as the package calls them, "meteorites." Oooh, even more fun! But man...these are on steroids or something. From the moment the package is cracked open, an audible chorus of crackling starts and just won't let up. You get anywhere close to the cookies, you will get popped on - they spark up and explode on the whim of whatever chemistry makes this possible. At one point I was a good two feet away from the nearest cookie and still got nailed on my elbow. Doesn't hurt, of course, but it's as if the cookies have an invisible force field that it dares you to chomp through, like it's not going to go down without a fight. The popping sensation carries through with each bite too. Crackle crackle crackle, chomp chomp chomp. There is a slight added sugary crunch as a result of the crystals, but not enough to greatly affect the flavor. The star cookies themselves are fairly basic, straightforward chocolate/sugar confections pretty close to the standard "from tree elf to store shelf" variety - of perhaps slightly better quality, perhaps, particularly with the chocolate (as is TJ's tradition). It's really the popping candy that makes these cookies worth note - heck, without them, Sandy and I would probably pass right on by and not even notice. As a nice little bonus, our kiddos seem a little wary of being sparked by their dessert, so we just might have this whole box to ourselves. We don't recall the exact price, but it was somewhere in the neighborhood of $3 - if you know, drop us that knowledge. It's a fun, silly, gimmicky purchase that we probably won't make often, but will enjoy while we can. This is an awesome idea! The package did caution consumers to be careful of the popping candy popping when package is opened. Maybe some of the candy fall out from the cookie and I'll just shove in there and enjoy it. Why TJ's haven't yet released their own pop rocks?! COME ON! I think that while Oreos is cranking out too many flavors. They should do a limited edition 4th of july with spiced cream and popping candy in the crème for fun factor. Packaging is catchy... I guess if you're a kid, it would be a win-win... 4 servings... 4 cookies a piece... = 16 total...kids would kill for this.. I will pass... the amount isn't worth the buy. Got the receipt right next to me, they are $2.99. I brought these to a 4th of July party last night and the ADULTS loved them. The 9 year old who tried them smiled and said "Weird Alert". They were a hit. My local store ran out before the weekend, but I found some at another store in the next city over. Bought 4 boxes. I'd like to see these become a year round item, like the Fireworks chocolate bar has become. One of the people at our party is a professional baker who lives in Australia. He was thinking of ways to incorporate pop-rocks into his creations.